Our Wai Citi Cottage is surrounded by wineries, eateries and wedding venues, including, Te Mata, Black Barn, Craggy Range,Chalk and Cheese. The cottage is set in a park like setting which is being developed, providing plenty of space for the children to roam in. For the cyclists we are in easy access to many trails--the closest being 3 minutes ride away. Havelock North is our nearest town and is 5 minutes drive . It is known for the abundance of cafes,eateries,art gallery, gift shops and dress shops. There are 2 swimming pools here, and a very popular new play ground for all children,including skate boarders. There's a movie theatre. For the golfer,we are 20 minutes to a choice of 3 courses--Hastings Bridge Pa, Maraenui Napier and 30 minutes drive to Cape Kidnappers. There's a 20 minute drive to the Art Deco centre- Napier, Hastings,the airport, beaches. The Cottage looks out onto a grass paddock in which ewes graze and lambs are born mid winter. Thoroughly enjoyed our relaxing stay in this comfortable home. Very close to many good wineries. Lovely property in a great area. 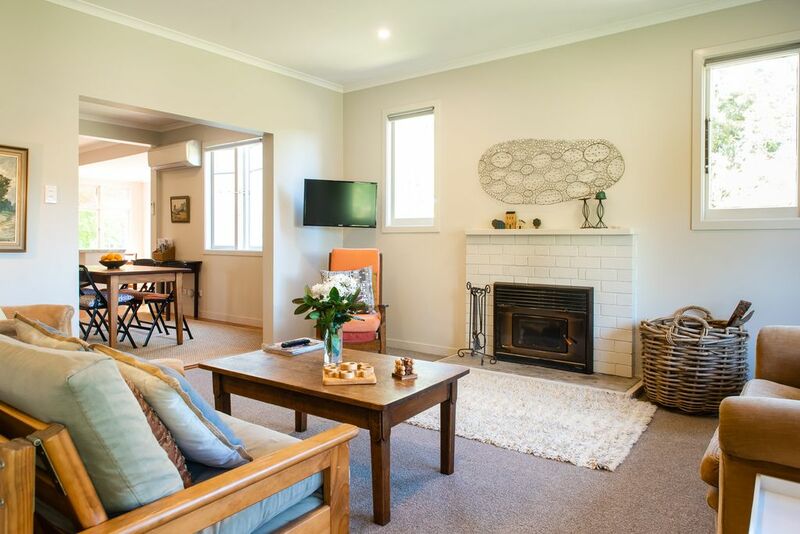 Comfortable cottage well located for access to the vineyards Havelock North and Napier. Location close to the road meant noise was a bit of an issue. Otherwise thoroughly enjoyed our stay. A gorgeous cottage, very spacious for a 2 bedroom and immaculately clean. We had a lovely stay, thank you. Lovely little batch in a great location, a short drive to town and close to vineyards, had everything we needed for a great holiday. Would recommend and stay again. Lovely stay in great location!! The cottage was really well furnished and super comfortable and more spacious than expected. We went to a function at black barn which is only 20 mins walk away. easy drive to havelock north village. would definitely stay again.